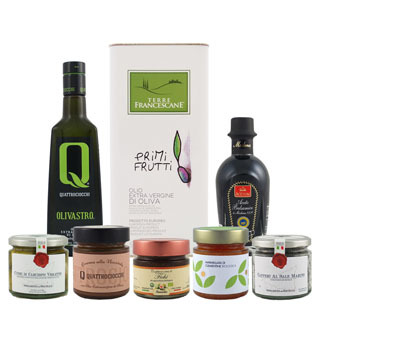 OLIO QUATTROCIOCCHI OLIVASTRO: This extra virgin olive oil is produced exclusively from 100% Itrana variety olives locally grown on the Quattrociocchi Estate in Alatri. This oil has a fruity aroma enhanced by complex notes of grass, artichoke, green tomato and apple. Its flavor is pleasantly balanced in bitter and spiciness with hints of green almond. CASTELINES L'AGLANDAU: The Aglandau olive variety is the most common flavor factor in Provencal olive oils and here it unveils its vibrant personality. Made exclusively from 100% Aglandau olives, it is an elegant green fruity oil with subtle notes of fresh cut grass note followed by mint and raw artichoke with a well-balanced bitter and spicy finish. This olive oil is ideal with a roquette salad, on a fresh goat cheese or on a tomato toast. No need to add pepper!